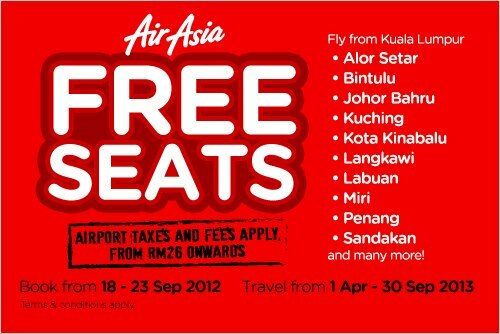 AirAsia FREE Seats booking starts on 18 Sept 2012! Airport Taxes & Fees Apply, from RM26 onwards! At AirAsia, two of their favourite words are FREE and SEAT!! That’s right guys, AirAsia FREE SEATS are back! Bring out that planner and calendar because it’s time to plan your next year’s holiday! Click the above picture to check out more FREE seats' destination! 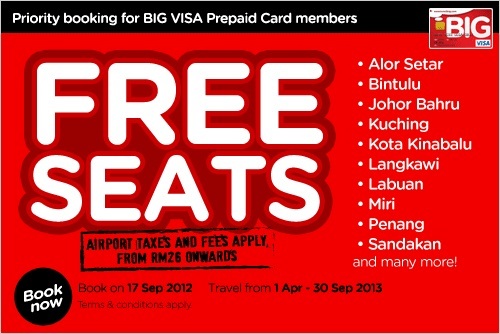 For BIG VISA Prepaid Card members, you get to book these free seats one day earlier ~ that's on 17 Sept 2012!